A recent study1 shows that, in the United States, approximately 100,000 deaths each year can be attributed to excess salt intake. It also suggests that a decrease of 9.5% in sodium intake (as has taken place in the UK in recent years) would prevent thousands of strokes and heart attacks in adults aged 40-85 years. It would also save more than $32 billion in medical costs. 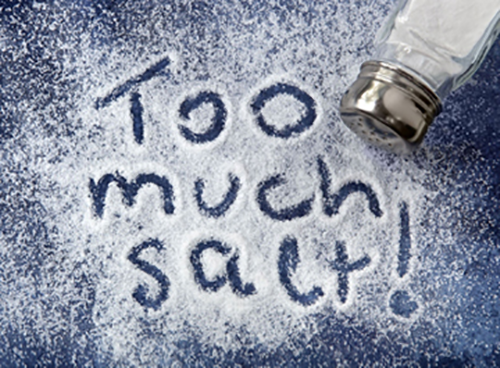 Many doctors and nutritionists recommend that we reduce our salt intake, but maintaining palatability in some foods can be difficult since reducing the salt can make them taste bland. We don’t just eat to live, we get pleasure from eating. The savory foods that we enjoy have a balanced, rounded flavor. Often this satisfying taste is due to the fat and salt content of the food. Adding monosodium glutamate (MSG) to recipes is a way to reduce sodium in foods, and reduce fat in foods, that still taste satisfying. Replacing table salt with MSG reduces the sodium content of recipes by up to 40% with no loss in palatability, as gram-for-gram glutamate contains only one third of the amount of sodium. 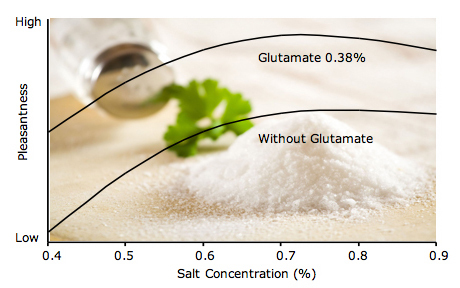 Glutamate is used at far lower levels than salt. MSG contributes only 1-2 percent of the total sodium contained in the average diet, even where it is used widely in food preparation. 1. Smith-Spangler C M et al, (2010) Population Strategies to Decrease Sodium Intake and the Burden of Cardiovascular Disease. The Annals of Internal Medicine. The chart below shows results from taste tests which demonstrate that people find food with low levels of salt (low sodium) significantly more acceptable when a small amount of MSG is added. The study evaluated people’s responses to different versions of a clear soup, with and without MSG and with different levels of salt. The broken horizontal line shows the threshold level below which the participants found the dish unpalatable. Monosodium glutamate is the sodium salt of glutamic acid, an amino acid which occurs naturally in protein-containing foods such as meat, vegetables and dairy products. Glutamate brings nothing new to the diet – the glutamate naturally present in food and the glutamate derived from MSG are identical and the body treats them in exactly the same way. Learn More: The International Glutamate Technical Committee (IGTC), a non-government organization (NGO), recently updated its review paper on “Glutamate Contributes to the Reduction of Dietary Sodium Intake.” The report provides a summary of research that has been conducted using glutamate to allow for substantial reductions in dietary sodium intake while maintaining food palatability.